A shift in focus has resulted in a number of LucasArts staff being shown the door. Staff cuts were announced at LucasArts yesterday, following a reshuffling of its resources. While exact figures aren't known, reports suggest that around 30 percent of LucasArts staff has been let go. In a statement, LucasArts said that it wanted to make its internal studio "first class," and was reorganizing its teams in order to achieve that goal. This meant that staffing levels had to be "adjusted." 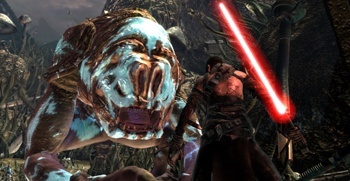 These cuts come just weeks after rumors that new LucasArts President Paul Meegan planned to drop several members of the Force Unleashed team and stop any external development of LucasArts properties. Without a lot more information, we can only speculate on what this means for LucasArts in the future. The studio clearly wants to focus on in-house development, but whether that will be instead of external development, or in addition to it isn't clear. LucasArts' statement does make mention of "fostering relationships with trusted external partners," but it could just refer to middleware providers like NaturalMotion, whose Euphoria engine was used in the Force Unleashed games.